Our boat anchored at the wooden pier of Erinia cove of Nea Kameni island. 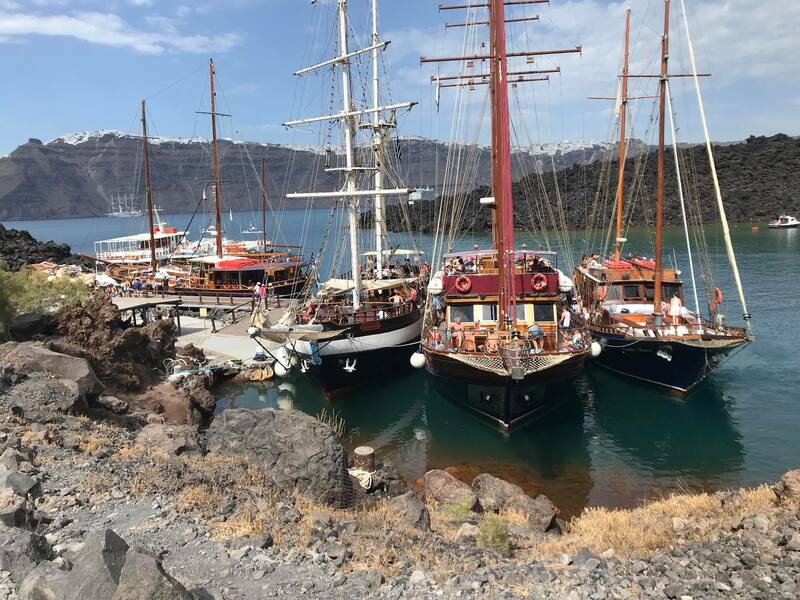 We disembarked from the boat and entered the Nea Kameni National Geological Park. There is a two Euro entry fee and the proceeds go to support monitoring of the volcano. 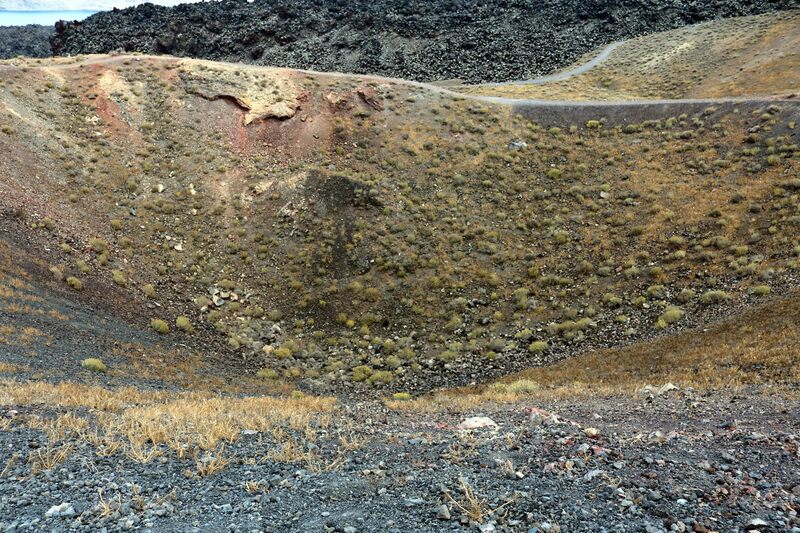 Vegetation is sparse with the volcanic rocks covered by red grassy bushes and yellow sulfur deposits. The 30-minute hike up over this volcanic mountain is moderately challenging but worth the effort for the breathtaking view that it offers. 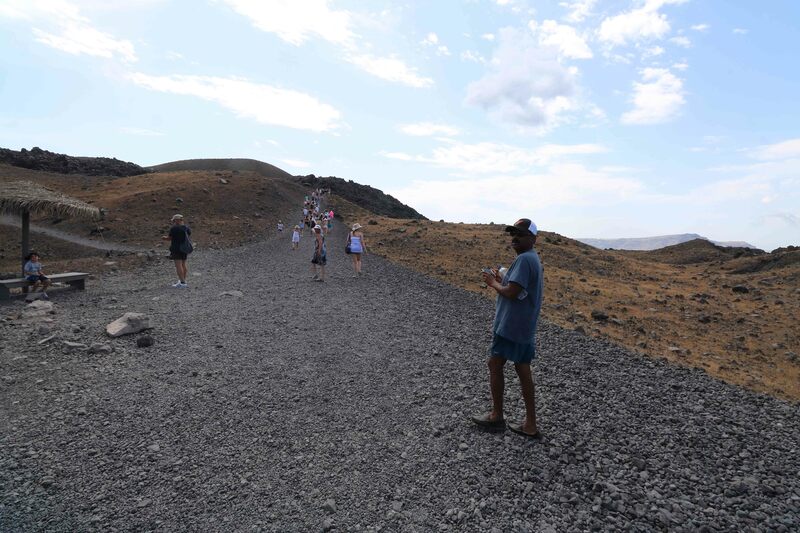 Hikers need to keep to the track full of stones and gravel formed due to cooling lava. Hence, proper walking shoes are a must. As we stepped into the Geological Park, the terrain was akin to that of a lunar-landscape. As we climbed up the hill, on the sides were solidified lava ejected by the volcano called volcanic bombs. These are the oldest volcanic bombs on the island and were the result of volcanic eruptions of 1573. 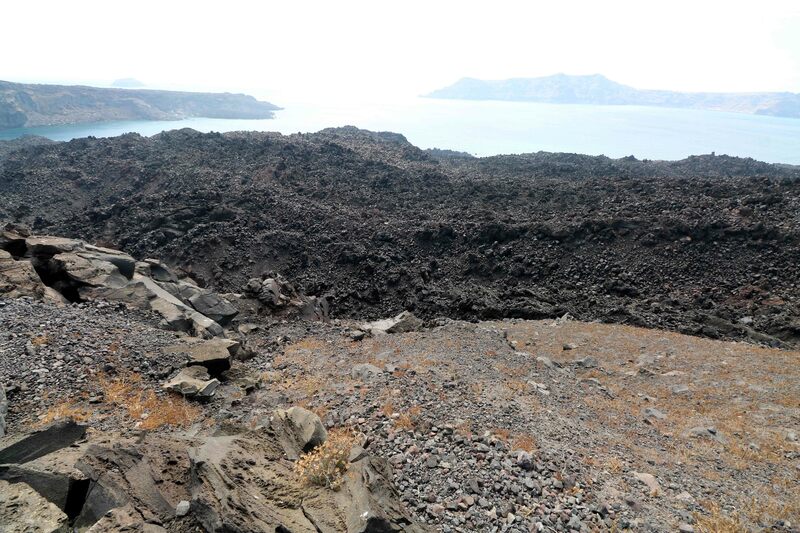 Further walking up, we reached slopes of the dome of Mikri Kameni, the oldest lava on the island. 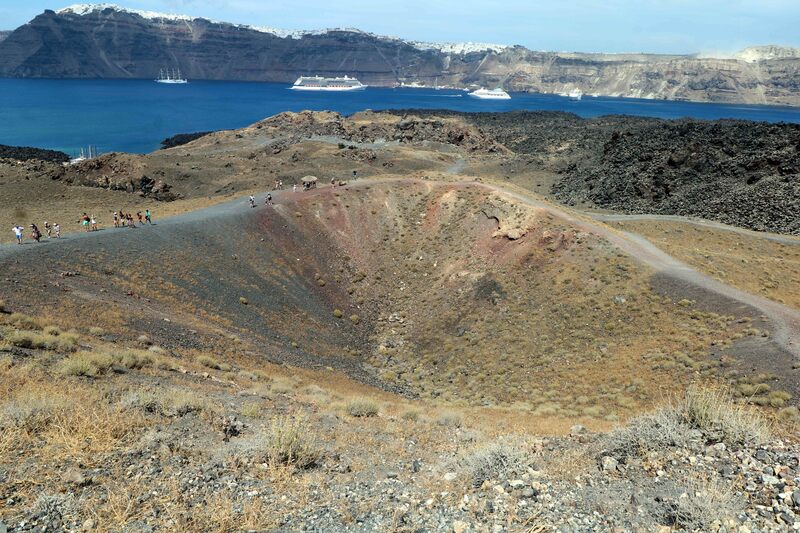 The path that led us to the top of this dome, to the crater of 1570 eruption. 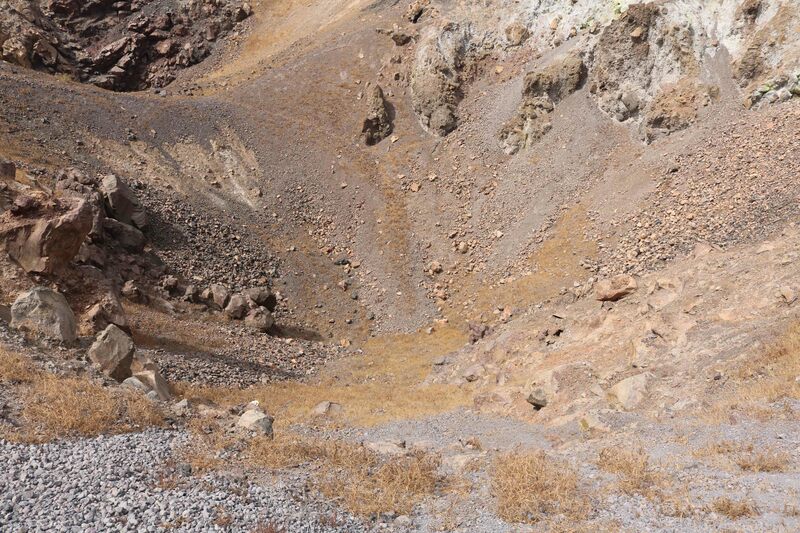 Our next halt was at the Dafne crater caused due to volcanic activity of 1925-1926. 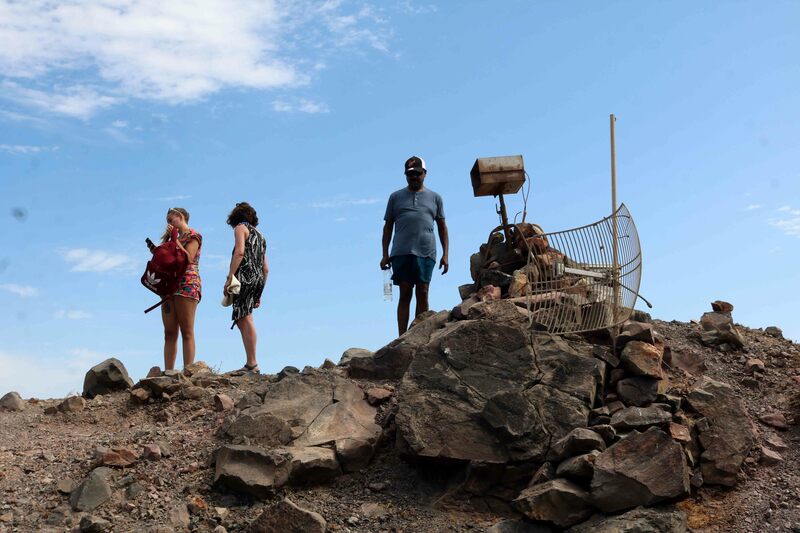 We then came to the twin craters formed as a result of 1940 volcanic eruption. Climbing further up, we came to Georgios dome peak. 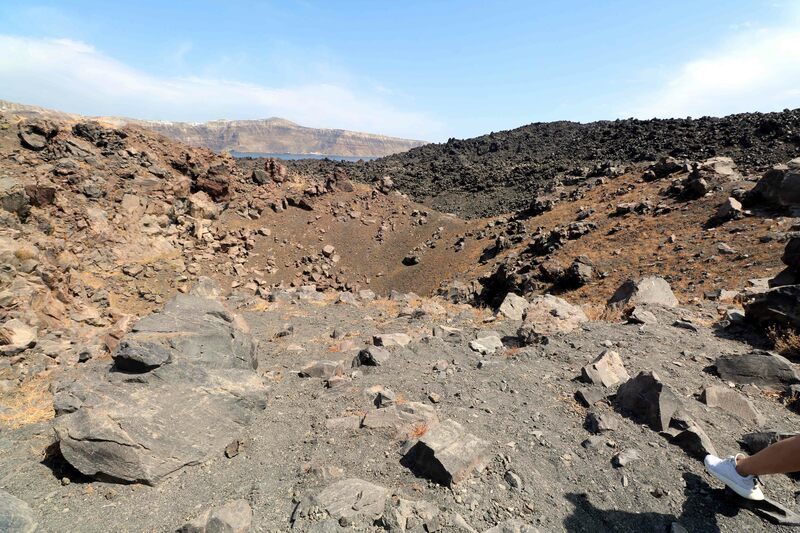 The crater here was created in August 1940 by two large volcanic eruptions atop of the dome of George, which was created in 1866. On top of the hill at about 127 meter we saw deposits of solidified Lava. 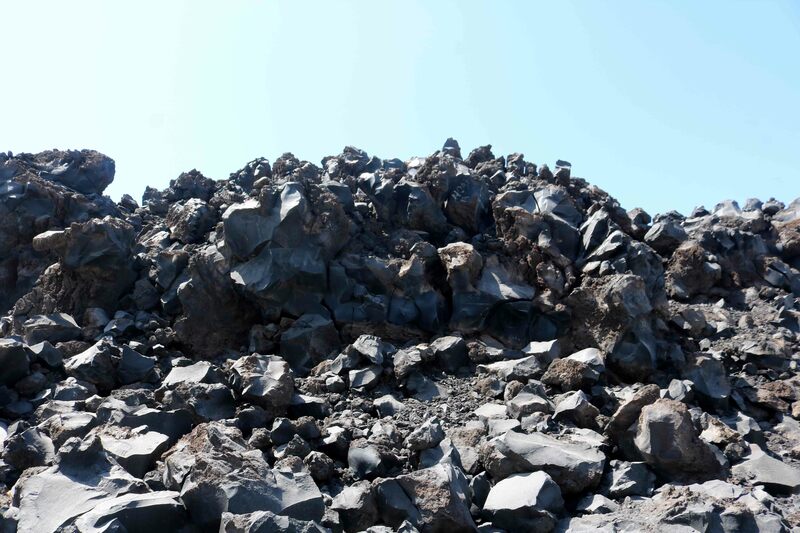 These rocks were formed due to cooling and solidifying of molten lava which erupted in 1950. On the top we could see that many sensors were deployed. The seismic sensors monitor tectonic activity that may precede a volcanic eruption. Carbon dioxide (CO2) emissions are also monitored. With modern technology and monitoring, it is believed that scientists are in a position to forecast the volcano’s next eruption, at least a few months to a year in advance. 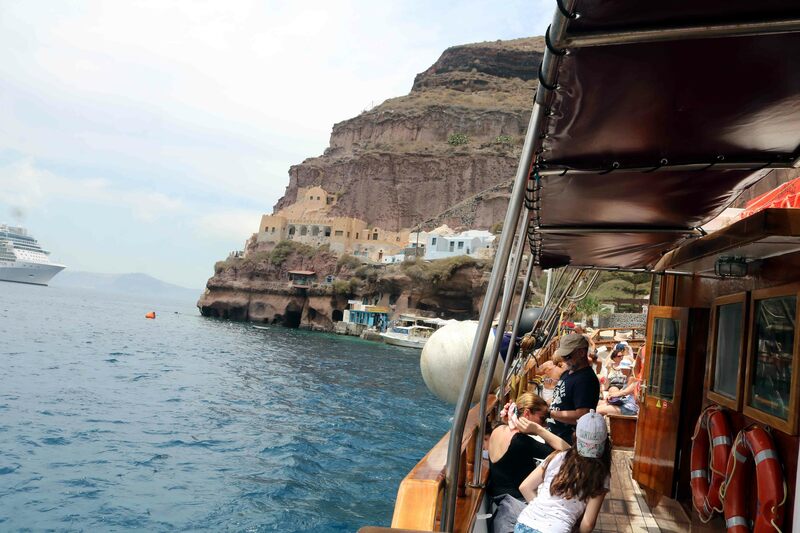 After spending about 90 minutes at Nea Kameni, our boat headed back to the Fira port. As we stepped out of the boat, we could hear the cacophony of donkey drivers hailing for passengers. The donkey is Santorini’s logo, its trademark mascot. 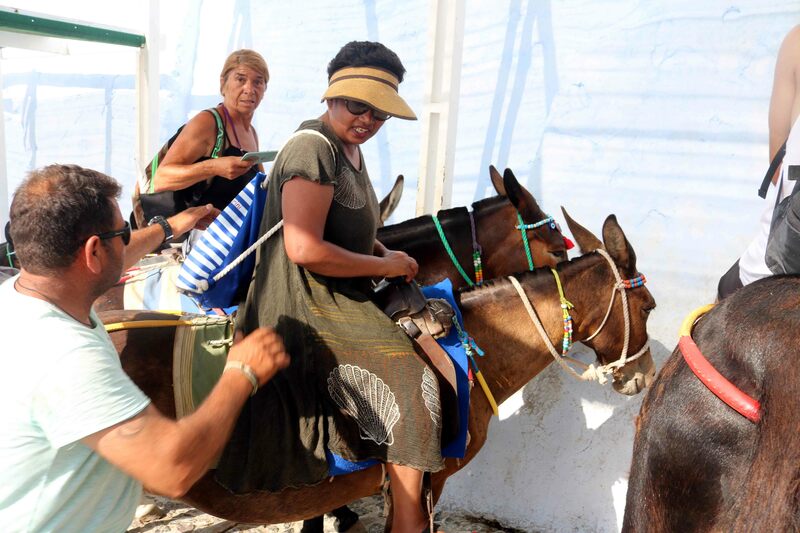 During a Greek wedding, the bride rides a donkey to the church and back to her home. 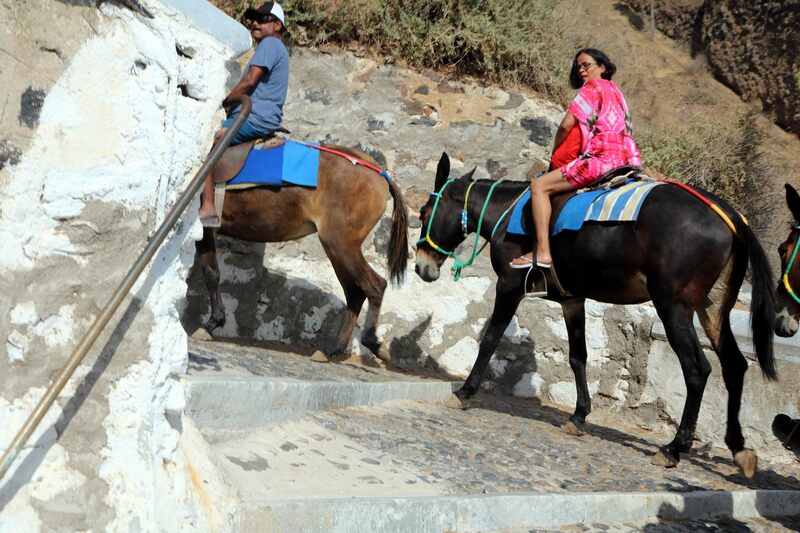 We all decided to take the donkey ride up the 588 steps of Karavolades stairs. These donkeys are well trained and the rider is required to sit firmly on the saddle. There are no reigns and so the rider has little or no control over the animal’s movements. As we sat on the donkey, they set off on the way up. There were many pedestrians walking up and down, so also other donkeys coming down the stairs. These donkeys steered their way through this ‘crowd’, as if they exactly knew what to do. For the donkeys it appeared that their only aim was to reach the top as quickly as possible. The level of training was quite akin to that of the famed ‘Mule Artillery’ of the Indian Army. On reaching the top, the donkeys stood at the donkey-taxi stand. The drivers helped everyone to dismount. We then had dinner at the Fira and returned to our hotel. On June 15, after breakfast we checked out of our hotel. 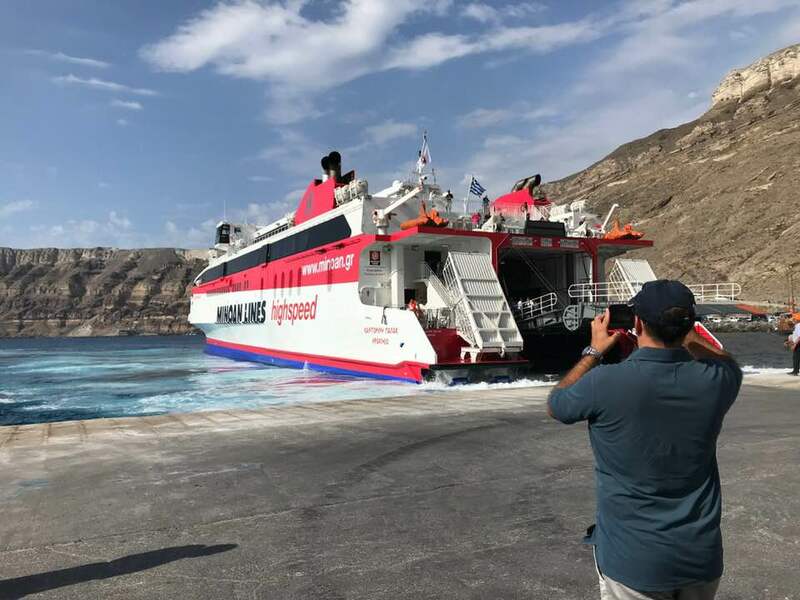 Our ferry to Crete island was scheduled for 4 PM. We then set out to explore the area around our hotel. Economy of Santorini, like all other Greek islands, is supported by tourism. Santorini grows a special variety of small cherry tomatoes, fava beans, yellow peas, cucumbers and white eggplants. 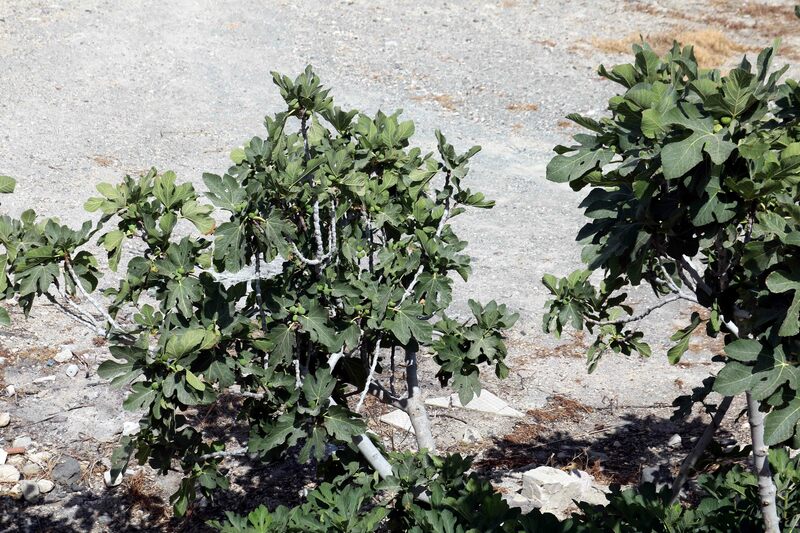 There are lots of wild fig trees growing all over the island. 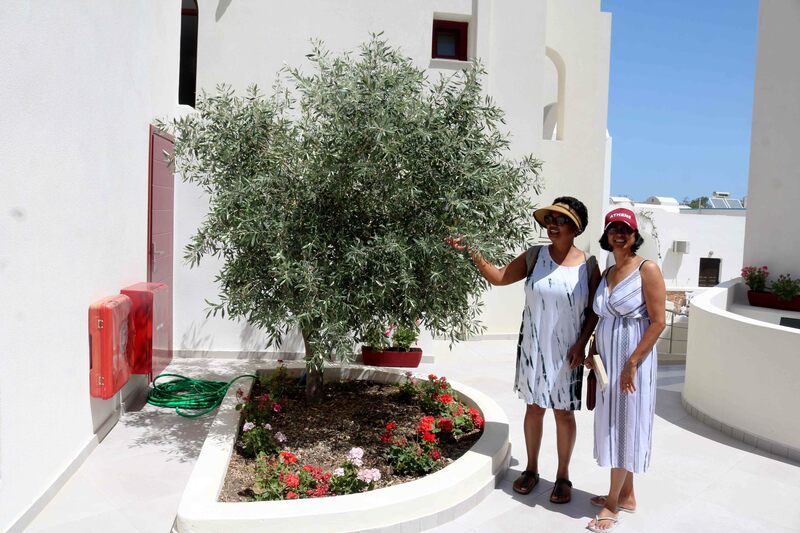 Unlike the mainland of Greece, Santorini does not grow olive trees due to the strong winds and the lack of water. Instead they grow a lot of pistachio trees. The olive tree above grows between the buildings at the hotel. From the Hotel, we walked down to Kamari beach resort. On the Southern end towers the enormous rock of Mesa Vouno with the archaeological site of Ancient Thira on its top, 400 meters above the sea. The beach offers a wide range of facilities like sun-beds, umbrellas and various water sports. The water is deep and blue, the sand is black. The beach is filled with black sand and pebbles as a result of extensive volcanic activity over centuries. We boarded the high-speed ferry operated by Minoan Lines to Heraklion, Crete. The cruise was very comfortable and smooth. 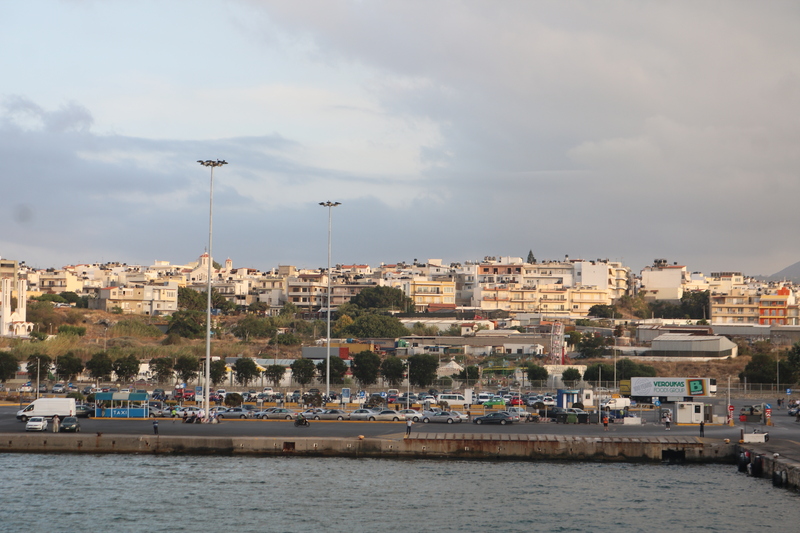 We reached Heraklion port by 5:30 PM. We drove to our hotel by taxi and checked in. As the night fell, we walked to explore the city. 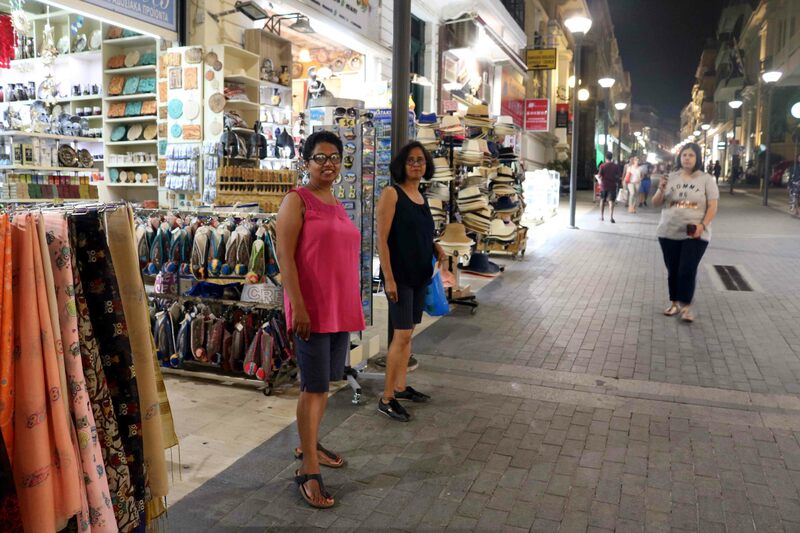 We walked to the largest cistern to provide drinking water to the Heraklion port. The cistern consists of two oblong vaulted chambers linked by arched openings. Light and air enter the cisterns through large light shafts on the top of the vaults. 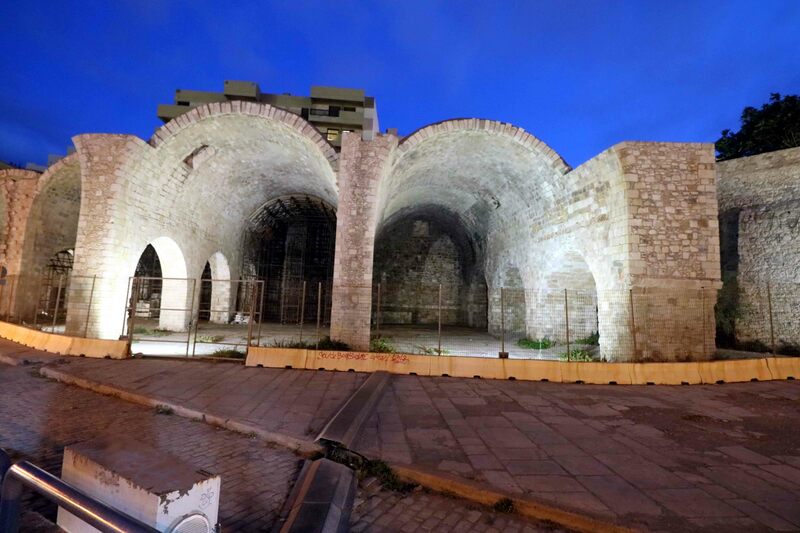 Today, all the daily garden watering needs of Heraklion Port Authority (about 7000 litre of water) is provided from an underground cistern, built by the Venetians (People from Venice), hundreds of years ago. Venetians also built a series of shipyards (known as Arsenali) at the southern and the eastern area of the port, in order to house and protect the activities of the building and repairing of ships. 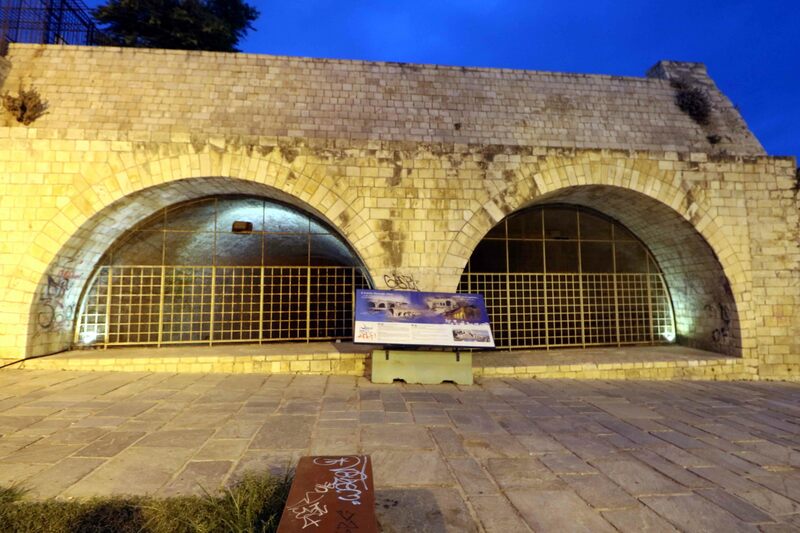 These large, barrel-vaulted buildings were shipyards built by the Venetians and were capable of housing ships in need of protection or repair and for the construction of new vessels. 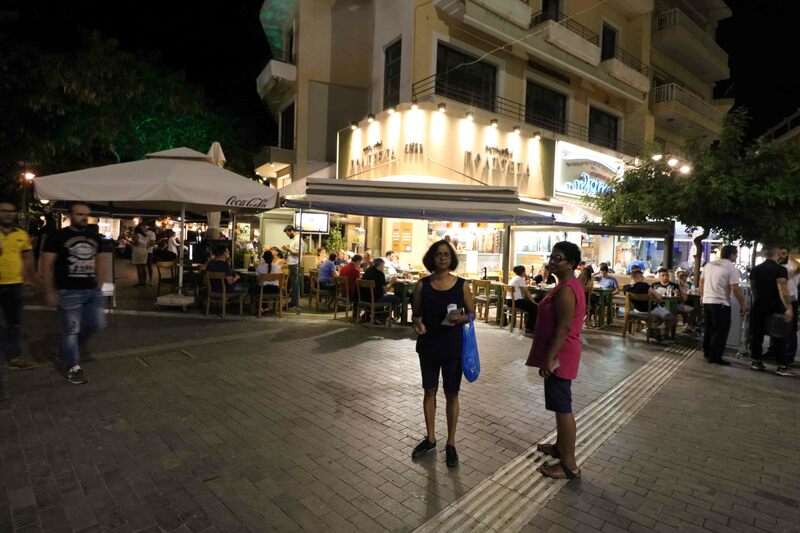 Night life in Heraklion is very hectic with shops, restaurants, taverns, discos, clubs, etc, all open till 3 o’clock in the morning. Summer in Crete and in Greece means ‘tables outside’: The guests meet the local people and everyone joins the party. We had Cretan cuisine for dinner and retired to our hotel.